David and Goliath are Biblical characters. and the battle between these two is one of the most loved Bible stories. The story tells how a brave shepherd killed a giant with just five stones. David’s battle with Goliath is seen as the triumph of good over evil. The story teaches us that if we look at our problems from God’s perspective, then God will help us fight those problems. 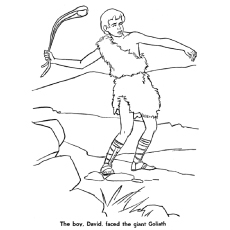 The classic story of David and Goliath has captured the mind of both children and adult for generations. 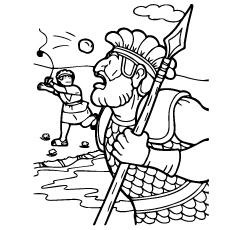 Here we give 10 David & Goliath coloring pages for your kids to colors. 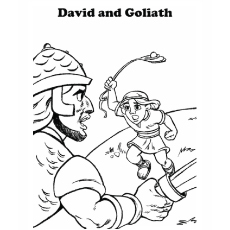 Give your child these David and Goliath coloring sheets after narrating the story. This will help them understand the story better. 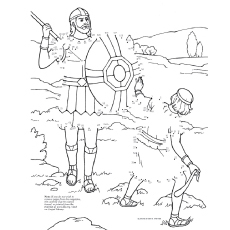 This coloring sheet features David on a field. The image has beautiful landscape for your kids to fill in the colors. David was a shepherd boy who lived in Israel. He took care of the sheep, but God had chosen him to take care of the Jewish people. He was born in Bethlehem in the tribe of Judah. He was an amazing musician and artist and also wrote many of the Psalms in the Book of Psalms. 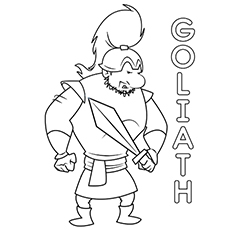 Here is a coloring sheet of the mighty Goliath in his cartoon form. 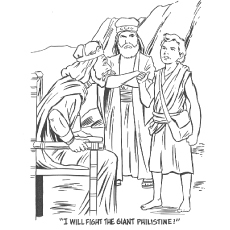 Teach your child more about Goliath with this coloring sheet. 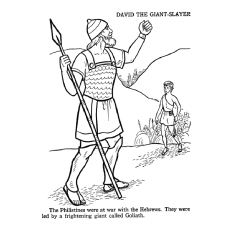 Goliath was a giant Philistine warrior who was defeated by the young David in the Bible’s Books of Samuel. The Philistine army had gathered for a war against Israel. 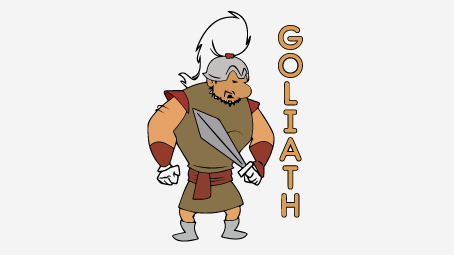 Goliath, the Philistine giant challenged the Israelites for a duel to decide the outcome in a single battle. 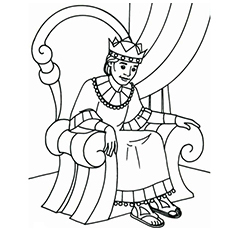 Here is a magnificent coloring sheet of King Saul, the first king of Israel. 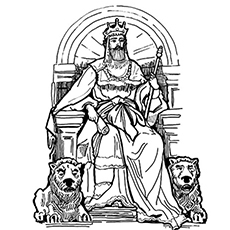 He was a brave and competent king of Israel. It is said that King Saul fell on his sword to avoid capture in the battle against the Philistines. 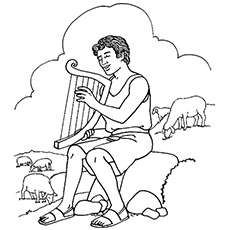 This coloring sheet features David playing a harp. Harp was David’s favorite musical instrument. He excelled at playing harp. Whenever King Saul of Israel returned from a war, he would ask David to play harp for him. David’s music would make him feel better. Explain more about harp and other musical instruments as your child colors the sheet. This scene is taken from the battle between David and Goliath. It shows Goliath falling down to the ground after being hit by the stones. David had heard that King Saul has promised to reward any man who defeats Goliath. He then challenges Goliath to a duel. David hurls the stone from his sling with all his might. 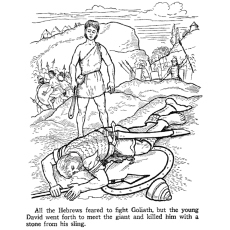 The stone hits Goliath in the center of his forehead. This makes Goliath unconscious and he falls to the ground on his face. 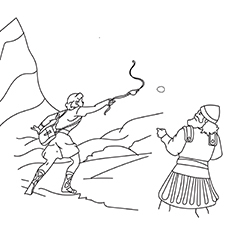 This coloring sheet features David throwing the stones at Goliath. 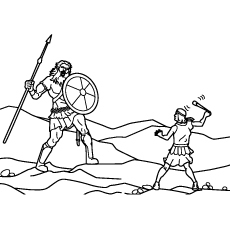 It depicts David’s bravery as he comes up against the giant Goliath with a couple of stones. David’s faith in God made him look at the giant from a different perspective. For him, Goliath was just a mortal man defying the all-powerful God. 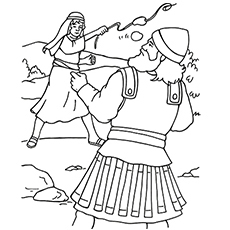 This coloring sheet can be used for teaching purposes in the Sunday school. David chooses five smooth stones from the brook and puts them in his bag. He then confronts the giant Goliath. David did not feel comfortable in wearing the king’s armor. He was comfortable using his sling, a weapon that he was skilled at using. Teach your kids about the five ways they can overcome the giants in their life. Teach words like confidence, courage, trust and victory while he colors the sheet. 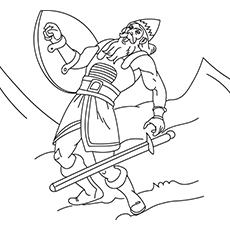 The coloring sheet shows the dead Goliath on the ground. 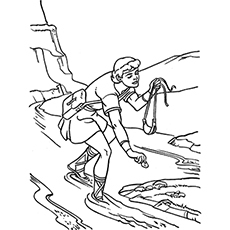 This coloring sheet can be used to create a bulletin board. You can also post a phrase like “You can do anything with God on your side!” on the board. 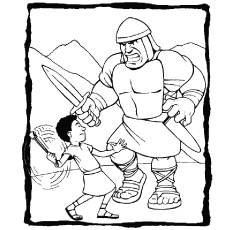 As Goliath moved forward, David reached for his bag and flung his stones at Goliath’s head. The stone hit the giant Goliath on his head and he fell on the ground. 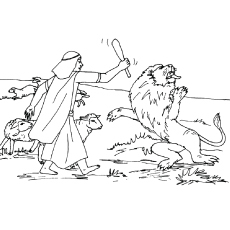 David then took Goliath’s sword and killed him. When the Philistines saw that their hero was dead, they tried to run away. The Israelites pursued, chased and killed the Philistines. 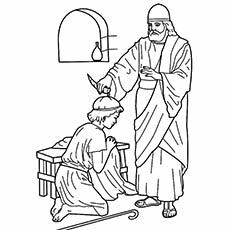 This coloring sheet shows the anointment of David as the second king of Israel. After killing Goliath with a slingshot, David joined the entourage of King Saul. King Saul had become increasingly jealous David’s popularity. He even tried to kill David several times. However, with the defeat of the Israelites and the death of Saul, David was anointed as the new king of Judah. He later defeated Ishbosheth, the son of Saul to become the King of Israel. 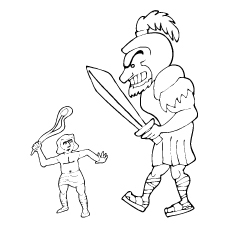 This is a coloring sheet of David and Goliath in their cartoon form. The image shows the contrast between the two fighters. 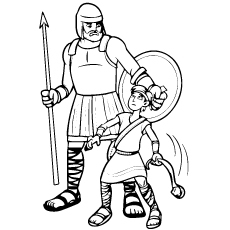 Goliath is seen clad with armor and shield from head to toe, while David is only with his staff and sling. 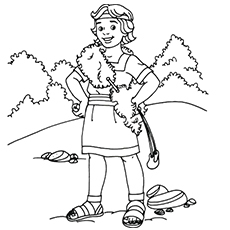 David is dressed in a simple tunic and is carrying a pouch full of stones. It also shows the difference in their stature. Goliath is a 9-foot man while David is a tiny teenager. 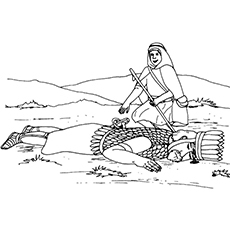 Yet, David manages to defeat the giant and save the Israelites. 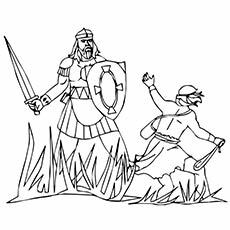 Your children will surely have fun meeting this brave shepherd through these free printable David and Goliath coloring pages online. It will teach an important concept like God takes care of all his people. 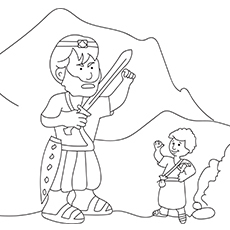 You can print out these David and Goliath coloring pages printables for the children in the Sunday school classes. Give us your feedback in the comment section.